It’s that time of year again, the November month is officially upon us, so do you know what that means? As you all hopefully know by now, November is National Diabetes Month. It is an entire month that is devoted to recognize and spread awareness about diabetes which is growing epidemic amongst human. But as diabetes in pets is on the rise, it’s a great time for pet owners to learn and teach others about diabetes in pets. The more you know about diabetes, the better you can productively manage the health of your pet. Just like in humans, when pets such as dogs and cats may be unable to produce enough insulin or possibly their bodies do not allow them to use insulin properly, their pancreas release insulin into the bloodstream. Then regulate blood sugar (glucose) to enter the bloodstream and cause a rise in blood glucose levels. In simple words, diabetes disorder is caused due to the shortage of insulin or insulin resistance which is necessary for survival. 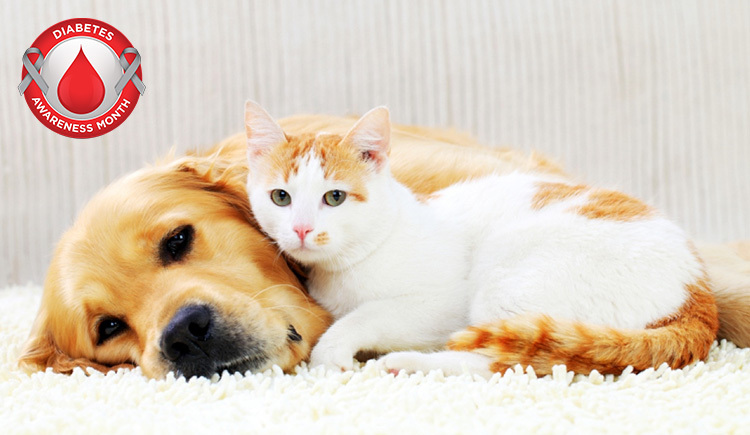 There are two types of diabetes in pets: Type I and Type II. Dogs are most commonly diagnosed with Type I that results from a deficiency of insulin in the body, whereas Type II is most commonly seen in cats where the body makes inadequate insulin. So, if you are a responsible pet owner and worry about your pet, identifying your dog or cat is showing signs of diabetes can be helpful to save their life. If it is not treated early, diabetes can lead to a number of serious health problems for your pet. Maintain your pet’s healthy lifestyle with well-balanced diet and regular exercise. This is necessary for proper weight management. Require a regular vet checkup for your pet. Just vet can diagnose diabetes and provide an appropriate treatment and management programs for your pet. Generally, diabetic pets may need one or two daily insulin injections to control blood glucose levels. And it is a more effective way for diabetic pets. Even you can administrate insulin to your pet with proper instruction from your veterinarian, patience and practice. Moreover, the advancements of technology have made it easy for pet owners to monitor pet’s blood glucose levels themselves at home. Plus, keep a daily record of your pet’s health, insulin injections, activity levels, diet and behavior as well as any small difference. This is the basic information about diabetes in pets that might be helpful to increase self-awareness and knowledge about it. So, in honor of this diabetes awareness month – let’s raise awareness and do something to enjoy this special time of year with our pet! Spread the word about all about pet diabetes on social media. Encourage pet owners to be responsible and considerate, like working out with a pet instead of just playing. Talk to pet-owning family and friends about getting a regular vet check-up and discussing their pet diabetes risk with a vet. Donate to pet care center or organize a fundraising event in your pet parents association. Distribute posters and brochures regarding pet diabetes. Ask your vet to be ready for an inspirational speech on the importance of well-balanced diet and regular exercise for reducing diabetes risk in a pet. Message to pet-owning friends about Pet Diabetes Month. Organize and host an event in your community for pet diabetes education. In nutshell, pet diabetes is a rising disorder in the world, it is not a life-threatening disease and cannot be cured completely – but it requires intensive supportive care and commitment from you, the pet owner. And for that it is most important to know about how to reduce diabetes risk – and it is one of the main purposes behind the creation of pet diabetes month. Your diabetic pet can have the same lifespan as a normal, healthy dog.